CAD/CAM technology allows the office to design restorations on a computer screen. 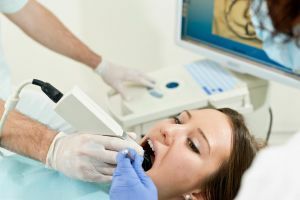 It displays a 3-D custom image of your tooth/teeth obtained by capturing the image with a digital scanner. The dentist then uses those images to design a final restoration. The restoration is milled from a block of ceramic material in a milling chamber, customized and finished. The benefits include restorations that are stronger and less likely to fracture as well as the opportunity to have your restoration created in a single visit. CAD/CAM dentistry is not an answer for every instance, so consult with the dentist to see if it is the right option for you.